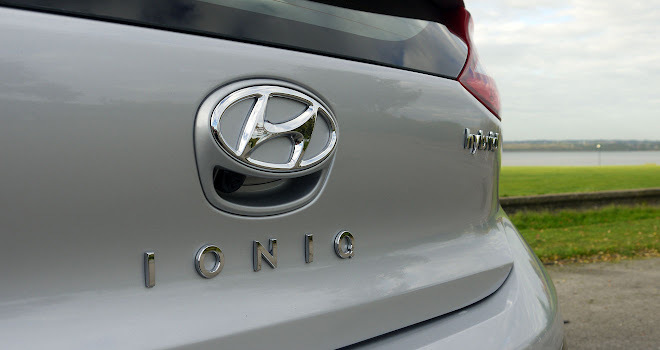 Hyundai’s engineers had their work cut out with the Ioniq range. Their aim was to create one design that would stretch across three distinct segments and be competitive in each. Two of the trio are available now: a battery powered Ioniq Electric to square up against the likes of Nissan’s 30kWh Leaf; and an Ioniq Hybrid to tussle with Toyota’s iconic Prius, among others. The final member of the trio won’t arrive till next spring – an Ioniq Plug-in Hybrid to compete, on tax terms at least, with cars like Mitsubishi’s Outlander PHEV. So how do the three Ioniqs fare? We’ll have to wait to learn about the plug-in variety, but the Ioniq Electric is immediately impressive and deserves consideration by anyone looking for a mid-sized EV, even if it is a little late to the party. It measures up well right now but could soon be eclipsed by newer models with bigger batteries and longer ranges. It seems reasonable to suspect that Hyundai is already busy working on a battery upgrade. The Ioniq Hybrid is arguably in the same boat, or perhaps even trailing behind in the water. It might easily have nosed in front had it arrived just a couple of years ago, but the latest edition of Toyota’s Prius has pushed the state of the art in slinky hybrids a bit beyond the new Hyundai. As a result the Ioniq Hybrid lags behind the latest Prius in outright fuel efficiency, although it is a lot cheaper. And lack of cost can go a long way to redress the balance. 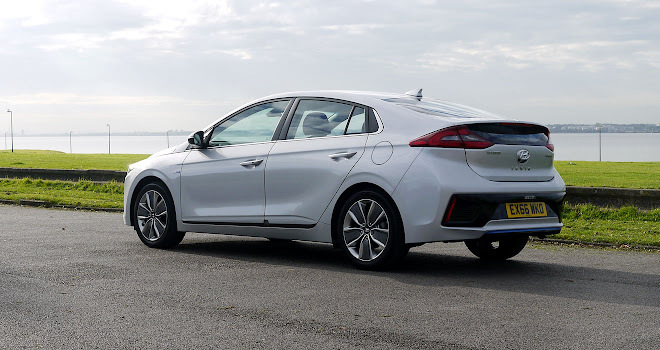 Pre-option prices for the Ioniq Hybrid run from £19,995 to £23,595 across three trim levels, whereas the Prius range starts at £23,600 and goes all the way up to £27,755. That’s roughly an 18% price differential between Ioniq and Prius – quite significant in anyone’s bank account. No doubt Hyundai would be quite happy to see its Ioniq Hybrid perceived as a cut-price Prius alternative. However, that wouldn’t really be fair to the Prius. In reality it is probably the Toyota Auris Hybrid that the new Hyundai will have to beat to become a success. Check specs and you’ll find the Ioniq fits between the Prius and Auris in terms of overall size as well as luggage volume, and offers roughly the same level of performance. With the 0-62mph sprint completed in 10.8 seconds, the Hyundai beats Auris by a mere 0.1 seconds and trails the Prius by just 0.2 seconds. Emissions ratings are also revealing: the Auris and Ioniq hybrids are both pegged at 79g/km; the Prius is a step ahead at 70g/km. Bear in mind that the Auris Hybrid uses previous-generation Prius technology and it’s plain that the new Ioniq has landed a little behind today’s cutting edge. A rating of 79g/km is still excellent of course, aided by high-tech efforts like extensive use of high-strength steel in the body, an aluminium bonnet and bootlid, flush underbody covers and aerodynamic wheel designs. Active flaps in the front grille, plus an “air curtain” that reduces turbulence by guiding air around the front wheels using slots in the front bumper, also help to cut drag. Then there’s styling. 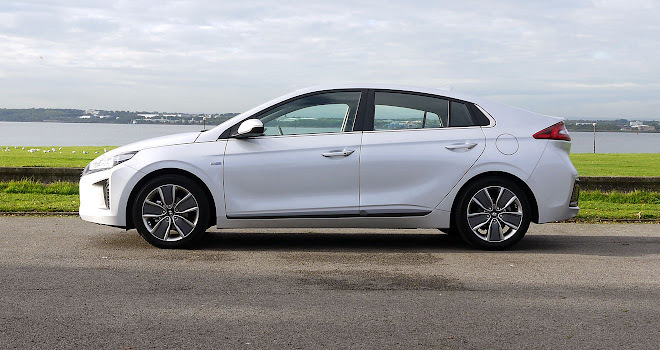 If you find the latest Prius too wedgy and weird, and the Auris too pointy and shouty, then you might warm to the Ioniq’s generic hybrid outline. While not especially inviting the styling is neatly finished, well proportioned and not at all aggressive or offensive. Under the bonnet there’s a 1.6-litre petrol engine providing up to 104bhp, combined with a 32kW (43bhp) electric motor. Motor and engine can join forces or operate separately to drive the front wheels through a six-speed dual-clutch automatic gearbox. Overall hybrid output peaks at around 140bhp, with a maximum 265Nm of torque. The electric motor is integrated into the transmission, allowing the engine to shut down while the car is moving under battery power, which it can do at moderate speeds for short periods of time. A 1.56kWh lithium polymer battery has been housed under the rear bench seat, alongside the 45-litre petrol tank. The battery relies wholly on brake regeneration for its charge – it can’t be plugged in for a top-up. The six-speed gearbox makes the Ioniq Hybrid feel a lot less outlandish than a Prius or Auris Hybrid to drive. 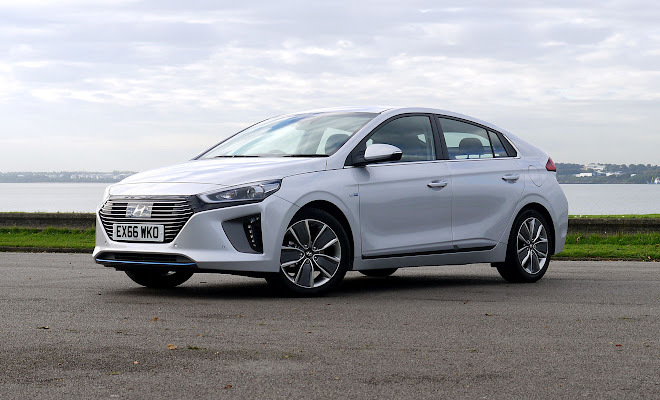 Whereas the Toyotas offer up a spring-loaded gear selector and a rubber-band feel under acceleration, as a result of the continuously variable Synergy Drive transmission, the Ioniq feels entirely normal. Revs vary and gears swap in familiar fashion, just like any other dual-clutch auto. Only the tendency to set off in electric silence gives the hybrid game away. That and the ultra smooth way in which the engine shuts down and fires up again. Braking is not quite so familiar. 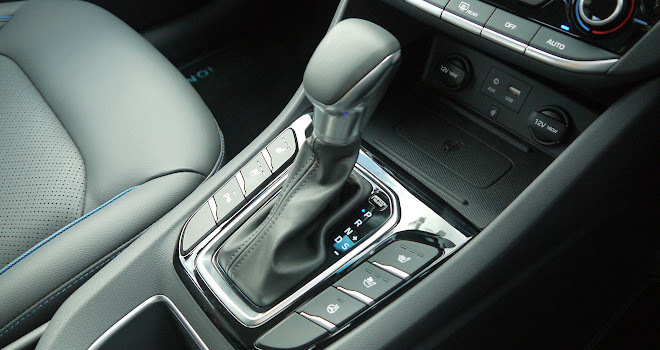 The pedal lacks any kind of initial bite, presumably guiding you towards the more gentle braking that maximises energy recapture for the hybrid system. The last few yards of drawing to a stop can also feel a little unsettled, as regeneration hands over to mechanical stopping power. It’s hard to draw to a halt without a final moment of judder. There’s also a foot-operated parking brake, rather than a conventional handbrake, which can take a little getting used to. 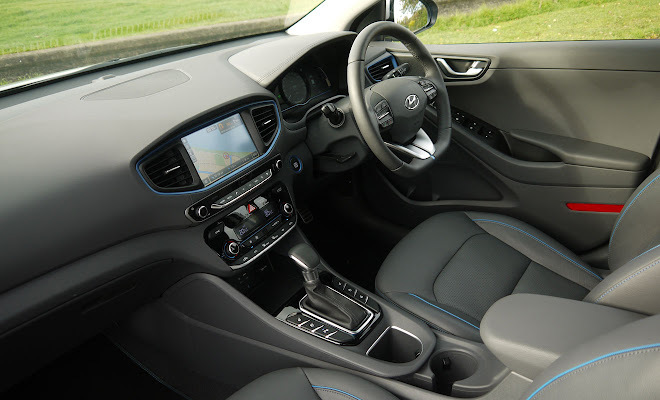 It’s a surprising thing to find in a Hyundai, particularly given that the Ioniq Electric has a fully electronic handbrake controlled by a centre-console flap. Perhaps the foot lever is there because the Prius has one. You wake Hyundai’s hybrid with a prod of its push-button starter, then slide the gearshifter out of park. Select D and the car will set off in its standard Eco mode, though you can slide the gearstick across to choose Sport mode. As well as altering the gear transition points to emphasise performance rather than economy, Sport mode also reduces steering assistance and makes the throttle react more eagerly. The digital instrument panel switches into a red theme, bringing up a rev counter that surrounds a central numerical speed readout. 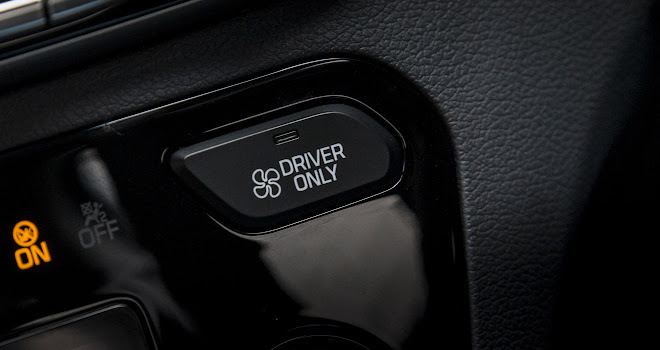 You can override the gearbox shift pattern in Sport mode by nudging the stick forward or back, though it’s hard to imagine many Ioniq owners bothering to do so. The car does feel reasonably lively in Sport guise though it’s not a particularly fast or sporty car no matter what you do. Happily the interior feels snug and comfortable, with pleasant surfaces above the elbow and scratchier plastics relegated to lower levels. To my eye it looks more inviting than the Auris and less outlandish than the latest Prius interior. The dashboard design might seem a little timid compared to, say, the latest Renault Mégane with its tablet-style interface. 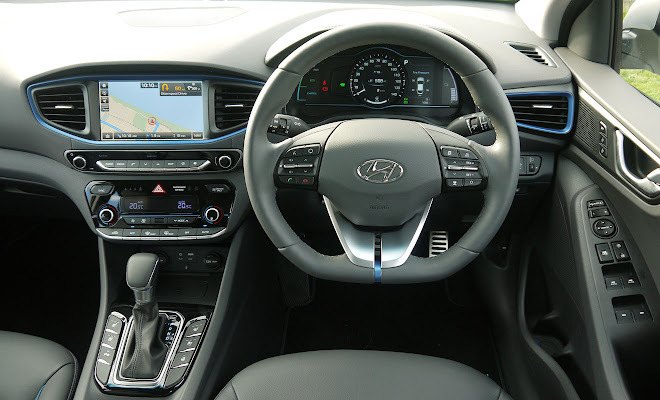 There are quite a lot of physical switches in the Hyundai for a car that comes with a 5-inch touchscreen as standard; an 8-inch screen features in cars trimmed above the base grade. 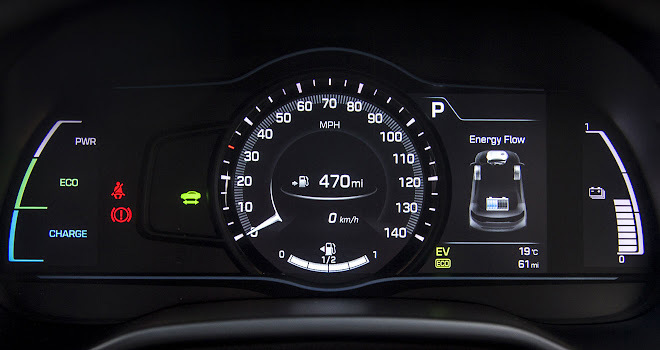 High-tech credentials are restored by the instrument panel, which on all grades is a 7-inch digital display with bright, crisp, neatly-designed graphics. Cordless charging facilities, Apple Carplay and Android Auto support on higher-spec Ioniqs will also be a boon to those with compatible smartphones. 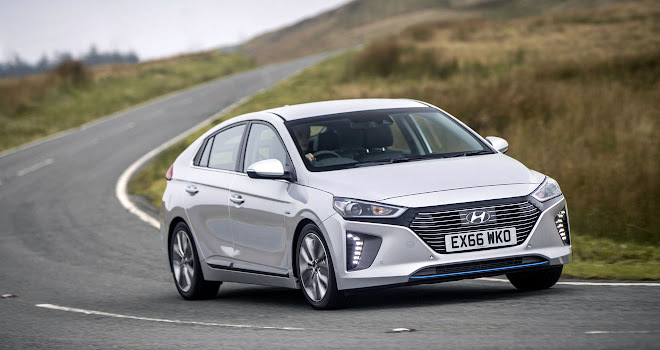 All things considered, the new Hyundai Ioniq Hybrid provides a welcome new option in the petrol-electric hybrid market, sales of which have been running 25% ahead of last year so far in 2016. It’s not quite a cut-price competitor to the Prius, but anyone considering an Auris Hybrid or indeed any other car in the same price bracket should make sure they include the Ioniq on their shortlist.